Riley Lee began playing the shakuhachi in Japan in 1971, under the guidance of Chikuho Sakai II and Katsuya Yokoyama. In the early 1970s, he became the very first non-Japanese professional taiko player, as a founding member of Ondekoza. In 1980, he became the ﬁrst non-Japanese to attain Grand Master (dai shihan) rank in shakuhachi. Riley has a PhD in ethnomusicology from Sydney University, and a BA and MA in music from the University of Hawai’i. He was a research fellow at Osaka Unversity of Fine Arts. He has made over ﬁfty shakuhachi recordings, which are distributed worldwide. His most recent releases are on the Sounds True label (USA). He has composed numerous pieces for shakuhachi and other instruments. 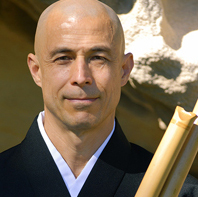 Riley taught at University of Hawai’i for six years, and in 2007 started a shakuhachi program at the Sydney Conservatorium of Music. Riley was a Visiting Fellow at Princeton University in 2006 and again in 2009, when he lectured in the Comparative Literature Department. In 1997, he co-founded TaikOz with Ian Cleworth. He was the Artistic Director and Executive Producer of the 2008 World Shakuhachi Festival in Sydney. 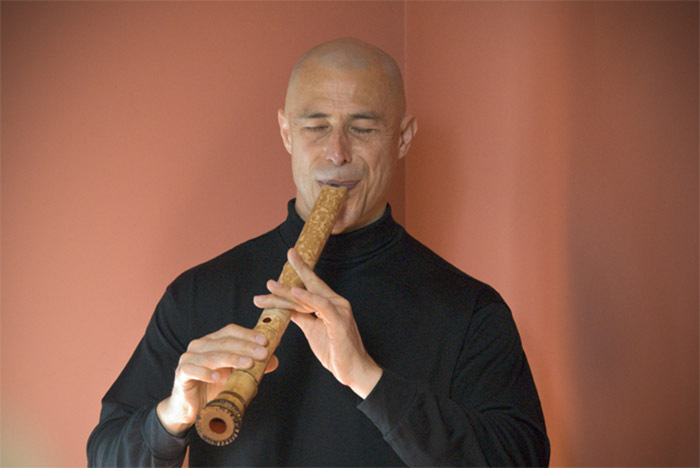 Riley tours the world as a performer and teacher of the shakuhachi ﬂute. In 2012, he is performing, teaching and recording in Australia, and in New York, Los Angeles, San Francisco, Colorado, Hawai’i, and again at Princeton University. Riley lives with Patricia in Manly NSW, and teaches privately in Sydney, Canberra and throughout the world via the Internet.